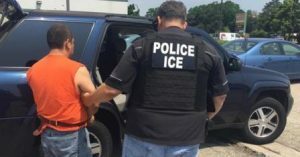 Author’s note June 10, 2018: this post on sanctuary cities keeps growing as our nation’s focus shifts from permissiveness to law enforcement. You can enjoy this tale of government gone wrong from the beginning or to read the latest updates just scroll to the bottom of this page. We keep hearing that Chicago’s public school system is out of money. City officials know that there are fewer and fewer things left on which to levy fees and taxes. Fortunately for illegal immigrants, being short on cash does not deter Chicago’s determination to school their children while it boasts being one of America’s sanctuary cities. Chicago emphasized its sanctuary city status this week. Mayor Rahm Emanuel came out in support of a “Welcome City Ordinance” to cement Chicago’s reputation as a city that doesn’t care about the immigration status of its residents. Dreaming up another ordinance to stress that the city welcomes illegals is a pointless PR exercise. Chicago stopped worrying about immigration long ago and has been a sanctuary city since the days of Mayor Harold Washington. The president and Homeland Security have already made it clear that the undocumented who have not committed a crime will be left in peace. Since Barack Obama has no interest in deterring non-criminal illegals, announcing a new ordinance to do more of the same rubs our noses in the city’s refusal to follow the law. Of course, those individuals had the option to not cross our border in the first place. They can leave or get in line with everyone else, but when legality and political agenda bump heads the law tends to lose. Gutierrez wants our legal system to protect illegal immigrants and ensure their rights are respected until that system can be overhauled to accommodate the demands of a huge source of Democratic support. In the meantime, we have sanctuary cities. California cities are well represented on the sanctuary cities list. Like Illinois, California is broke. Washington D.C. is also on the list, which is ironically appropriate. New York is no stranger to destitution, budget problems, and the importance of being a sanctuary city. If America keeps swallowing the pro-amnesty gibberish the president and his acolytes are spouting, the number of sanctuary cities will undoubtedly grow. Does being a sanctuary city and being broke mean that illegals run up enormous tabs for public services on the taxpayer dime? No, but they do chew up more in services than they pay in tax dollars. As a welcoming city, Chicago wants to make sure that illegals seeking services are left alone. Thinking of moving? You might want to check a list of sanctuary cities. This is a symbol of irresponsible government and lack of respect for public money. Whether your new town favors illegals will tell you a lot about how your tax dollars will be treated. It’s also a good gauge of how much you will be paying for liberal permissiveness in the years to come. A Republican president is about to join a GOP Congress after eight years of liberal immigration enforcement. Emanuel’s insistence on maintaining sanctuary city status for Chicago is once again in the news.3 His stance creates a predicament for Democrats. How do you justify federal control of party favorites like health care while denying Washington’s right to enforce laws that are solely within its purview? Obama and the Justice Department used the argument of federal hegemony against states who wanted to enforce their own laws to protect taxpayers from illegals. It can’t work both ways. This is a prime opportunity for a GOP-dominated Washington to use the same strategy against cities that insist on ignoring our laws. Which is worth more, offering sanctuary to illegals or being handed federal grant money? That’s a question mayors like Rahm Emanuel need to answer after President Trump put pen to paper today to start cracking down on sanctuary cities. Going to bat for illegals is a foolhardy decision when you are already broke and could lose your federal handouts. Canceling federal grants won’t exactly be a boon to big city taxpayers, either. It’s wonderful to finally have an attorney general who understands that “illegal” applies to more than police officers. Yesterday Jeff Sessions renewed his insistence that sanctuary cities comply with immigration law. He focused on keeping people safe and that’s a good thing. The bonus we haven’t heard a lot about is that by cutting federal funds we don’t force taxpayers in responsible cities and states to pay for illegal immigrant sanctuaries with their federal tax dollars. If Chicago and other cities want to harbor illegals, they can do it on their own dime. The move advances the Trump administration’s threat to withhold funding from illegal immigrant sanctuaries because of their refusal to comply with federal law. Rahm Emanuel remains a stalwart supporter of the illegals in his city. The letter set a June 30, 2017 compliance deadline. Immigration enforcement took a nasty turn in Texas yesterday over Senate Bill 4, which cracks down on sanctuary policies and levies penalties for refusing to follow federal immigration law. The mass protest shows what happens when party politics convinces people that the law doesn’t matter. It also raises a disturbing question: at what point do sheer numbers and the threat of mass protest make the law irrelevant? Do we need to step up deportations now to deal with the threat of foreign nationals who come here, refuse to obey the law, and then threaten us if we don’t give them what they want? A federal judge stood in the way of Texas’ SB 4 and now another judge in the Northern District of Illinois stomped Jeff Sessions’ plans to withhold federal grants from sanctuary cities. Judge Harry Leinenweber’s ruling yesterday means that if you live in a responsible city and state that doesn’t condone illegal immigration with sanctuary policies your federal tax money can still flow to safe havens like Chicago. No matter the legalities of the judge’s decision, we just sent another message that our laws don’t matter. We will overlook whatever laws and regulations activists find fault with. Illinois is not a big enforcement loss. Republican Governor Bruce Rauner has already signed a bill that effectively made Illinois a sanctuary state. The real tragedy is that the courts can force every taxpayer in America to fund this kind of irresponsible governing with federal tax revenue. By now you’ve no doubt heard that another federal judge, this time in California, has made sure that your tax dollars will continue to flow unchecked to sanctuary cities. Too bad for those of you who live in states that don’t think illegal immigrants should dictate where tax revenue should go, because after your money is mixed in the federal tax bucket you have no say in the policies that it funds. December 2, 2017: which of these tragedies can only happen in a sanctuary city? 1. A drug dealer sells heroin to a user who overdoses and dies. The dealer is convicted of murder. 2. Your son is away at college. He is drinking at a bar and gets into an altercation with another patron who falls, hits his head, and dies a week later. Your son is convicted of manslaughter and faces prison time. 3. A speeding car runs a red light, hits another car, and the occupants die. The driver is sent to prison for vehicular homicide. 4. An illegal immigrant and felon already deported five times and protected from federal authorities fires a gun. The bullet strikes a woman. She dies. He is found not guilty of murder and manslaughter. Only a weapons violation sticks. The illegal will be deported so he can come back a sixth time. Did you guess right? Then tell your congressman we need to pass Kate’s law. It’s enough of a travesty that we allow cities and entire states to shield illegals from law enforcement, but to let them off the hook for offenses any citizen would go to prison for is an offense for which our society does not deserve forgiveness. Rightfully blaming an “elitist mentality”5 that politicians use to justify their refusal to enforce federal law, Indiana Congressman Todd Rokita introduced H.R. 4526, the SLAP Act (Stopping Lawless Actions of Politicians) on December 1, 2017. The bill proposes penalties of up to 5 years in prison and $1 million in fines for officials who stand in the way of federal enforcement. Charging politicians with any kind of crime short of bald-faced theft is going to be a near-impossible feat, but given the failure of the courts to stand behind Jeff Sessions on slashing sanctuary city funding this is a bold statement about just how unacceptable the policies are that led to Kate Steinle’s death. Credit Rep. Rokita for having the courage to make a point that others in his party continue to back away from. On Friday the Congressional Budget Office released its cost estimate for S. 1615, the DREAM Act of 2017. Sanctuary cities aren’t the only consequence of illegal immigration that costs us money. The bill for taxpayers if this legislation passes is astounding. Details are discussed in my post about why deporting DREAMers is a responsible decision. January 25, 2018: sanctuary policies more important than unions? Everyone seems to have missed the humor when the Trump administration and the Justice Department pitted infrastructure handouts against sanctuary cities yesterday. How much do big city mayors like Rahm Emanuel and Bill de Blasio love their illegals? Even more than we thought, it seems. Democrats love infrastructure spending. It helps them hand our money to overpaid union labor, but they still opted to cancel their Oval Office appearances with the president after letters were sent to their cities demanding information on sanctuary policies. There has been a lot of criticism of the president because his actions don’t reflect any finesse in The Art of the Deal. After yesterday he deserves some credit. Activist politicians cheered lawsuits filed by the Obama Justice Department when states tried to pass their own immigration legislation, but they demand to be left alone when they choose to defy federal law to protect illegals while their taxpayers pay the consequences. You don’t need a big legal brain to understand how fundamentally absurd this stance is, but we’ll need the brains in the Justice Department to take the next step and make good on Sessions’ words. April 29, 2018: caravan to your wallet? Asylum seekers force the issue. Are we a sanctuary country? The caravan of migrants we have been hearing so much about cost us money long before it arrived. Every moment government employees spent preparing for their arrival, every minute border patrol agents dedicated to strategizing a potentially dangerous situation, and every second U.S. Citizenship and Immigration Services pondered how to deal with pleas for asylum stole money from your wallet. The much-awaited arrival at the border came today. I can sympathize with people who see the U.S. as a better place to live. What I can’t sympathize is the Federal Government treating their wants as a taxpayer obligation because these people decided to force the issue en masse. Ideally they would never have gotten close to a port of entry. It’s too late for that now. Central America and Mexico to show up on our doorstep expecting a better life. Asking for asylum because the U.S. is a great place to live is completely understandable. That’s no reason to grant special treatment or spend a single taxpayer dollar on the participants in what will undoubtedly become a media circus long before we buckle, let these migrants in, and set a precedent for being a sanctuary country that we will never be able to reverse. “In this tense environment created by an Administration intent on dividing us, we want to make sure everything about this action is above board and that individuals are being treated with dignity and respect. Taxpayers in every state should be upset and alarmed. What we need to hear from the government isn’t why ICE raided this employer or whether these individuals’ rights were respected. We need to know what Social Security Numbers they were working under and whether taxes were withheld from their pay. Otherwise it’s too easy for politicians to cover up the economic impact of illegal immigration with rhetoric about fairness, rights, and hard work. Education Secretary Betsy DeVos recently hinted that she understands the cost of sanctuary policies. She suggested on May 22, 2018 that schools could report undocumented children and their families to ICE. Taxes tie these two developments together: who pays, who doesn’t pay, and what legitimate taxpayers are paying to support. No wonder Democrats want to quash the proposed Census question on immigration status. State and local governments will have a tough time with their next property tax levy if taxpayers find out how many children they are educating who shouldn’t be in our schools. UPDATE April 13, 2019: America, can a migrant sleep on your couch? Defunding didn’t work. Our judicial system said no, but Donald Trump is an inventive guy with an amazing capacity to stumble through the barriers drawn by political correctness. He just came up with a perfect solution for our migrant dilemma. The president’s suggestion that we dump illegals in sanctuary cities is a bluff that quickly achieved the desired result. Nancy Pelosi showed her hand when she blasted the idea as unworthy of the presidency even though the speaker and her party have made it very clear that who is in the office is the only thing that matters. When Obama overstepped Democrats tagged along like schoolkids during a fire drill. For Trump simply opening his mouth is an abuse of power. Fortunately cooler heads prevail in the heartland. Departing the Chicago mayor’s office of his own volition, Rahm Emanuel responded by labeling America a “sanctuary country”11 and made it clear that his city has its arms open wide no matter what. As Windy City residents lucky enough to have measurable incomes write out their Illinois 1040 checks this weekend we hope that they agree. City taxpayers not only pay for sanctuary policies, they have to live with the sometimes tragic results. For voters in Illinois and elsewhere who put pro-illegal immigration Democrats in office, this is your chance to step up for what you believe in. Call your lawmakers in Washington and let them know you’ll be happy to house a migrant family or two. It doesn’t sound like Pelosi will follow suit but that’s not a big surprise, is it? Even our Republican Governor here in Illinois signed off on a sanctuary state bill, the Illinois TRUST Act. Democrats have repeated their “nation of immigrants” mantra so many times that even Republicans are using it when they talk about illegals. Good luck in Massachusetts, JoAnn. It’s too late for us in Illinois and especially in Chicago. Illiegal immigrants should’nt even be in this country ! My city I live in the state Representative is all for sanctuary cities here in Massachusetts ! Something needs to be done so it wont become one !